Tangled hair is a nightmare. Mine gets tangled easily, even just after wearing a scarf. I always carry a comb with me but it can be painful to gently untangle the mane. Same with a brush in general too. With a brush, my hair snaps will snap which is never good and can be painful, very painful to feel, see and hear. So I turn to the Tangle Teezer. This is the aqua version where it is hollow so water will not get trapped inside when it’s used in the shower. I’ve always believed that you’re never meant to brush your hair when it’s wet because it’s fragile at that stage. This took me a while to get use to the idea. I’d use this to brush through dry hair first to remove any knots before I get into the shower. I wouldn’t say this makes it the process fully painless but it does reduce the pain dramatically, not wanting to cry or scream. I’ve used this whilst shampooing and I didn’t feel like I need to add much pressure to brush my hair. I find using this whilst conditioning is the best. It helps spread the conditioner, hair mask or oil a lot more evenly as it glides smoothly coating each strand I hope. Before using it, I could immediately tell that there wouldn’t be enough grip on the side. It is easy to hold onto but it did slip out every now and again if I had used a hair mask or oil. I’ve noticed that hair breakage has decreased which is a huge plus for me as I’m growing out my hair. Much better than a wide tooth comb. The bristles are a bit harsh on the scalp but it does the scratching for you if you an itch in the midst of brushing! There are other vivid colours to choose from. This may be on the pricey side but I definitely need to buy the compact version for my bag. This looks like a nice brush for long hair. Wish I had one when my daughters hair was long. That's a very pretty colour of Tangle Teezer! I haven't tried the Tangle Teezer so far, but I really should, as I have horribly long hair that gets tangled so easily! But I love the concept of this one, wow! Wow i need this in my life! My hair gets pathetically tangled.. Even when i dont expose it to wind or anything. It tangles out of no where !! My hair was a nightmare before the Tangle Teezer, that and I never used to brush my hair. Love the idea of one you can use in the shower! I keep telling myself I'm going to invest in a Tangle Teezer but have yet to get round to it… I love this colour! 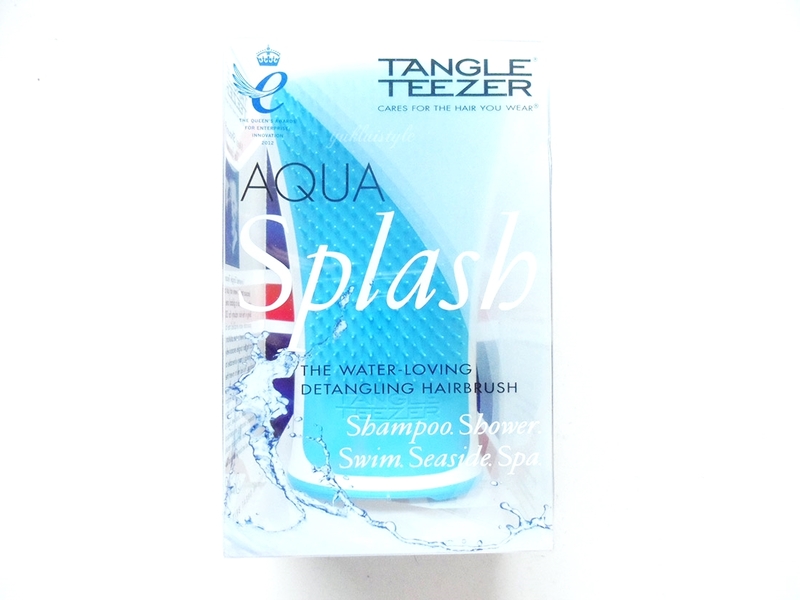 I have the original tangle teezer and it does definitely work better than a hairbrush! My hair tangles really easily too, but I'm so used to it that I just tug them out haha. I'd love to try this aqua one! I haven't tried this. I also used a hair pick in the shower to comb through my hair with the conditioner. I've been considering using something like this. Now that is one Hair Brush I have to own!! Will go search for it immediately! This looks neat! Would try it if I could somehow buy one online! I've tried the regular Tangle Teezer. I use it for combing wet hair. I haven't tried it because I've heard a lot people say it caused splits in their hair. I don't know if you have experienced that at all??? I have a similar one which I got from Klout Perk months ago and although I love the idea, I haven't used it as much. I love the one you have since there's actually room for you to hold on to it. never see this things sell in my country. but i think is really useful for my hair.. I also always have the same tangled hair. Moreover, I'm wearing hijab, so my head is fully covered. The most hard part of my daily life is when I want to wash my hair. I always need some extra time to untangle my hair strands since my hair is thick. Not to mention the hair fall after wards. Ergh. Are Makeup Wipes Bad For Your Skin?